Last weekend I participated in a 20-hour CERT training course taught by Scott Paul, CERT Bexar County, and organized by The Human Path. CERT stands for Community Emergency Response Teams, and is a national program for individuals who want to help out in case of a disaster in their community. In basic CERT training you learn the basics of personal safety, search and rescue, first aid, hazards, and leadership and organization. The training prepares people to form teams that can help out in case of home or wildfires, accidents, natural disasters like tornadoes or earthquakes, or other emergencies. Among other things, we learned the basics of first aid including head to toe assessments; how to safely lift heavy debris off injured individuals, how to use fire extinguishers safely; how to assess buildings for damage and then enter to search for trapped people; and how to operate effectively in teams. CERT is a great (and free!) training that really helps prepare you for the unknown. It’s also great reinforcement and practice of skills you may already have, as teams regularly drill and work on advanced training. Our class was great. We had a lot of hands-on practice with search and rescue drills, including how to lift walls or other heavy objects using cribbing and a lever. We learned how to find and carry out injured people from damaged structures. In two drills, we learned the importance of teamwork and organization. In the first, we were tasked with making peanut butter and jelly sandwiches for the whole group under a time limit, and although chaotic we succeeded in completing the challenge, with only a few minor errors. 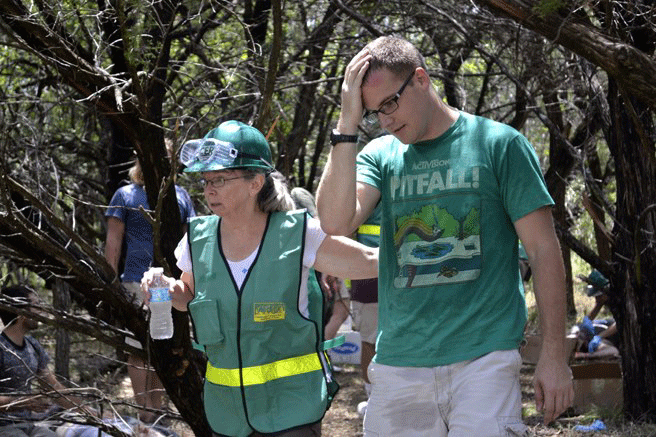 In the second, we simulated a disaster, with a CERT team rescuing a group of injured people. Some of the “injured” had fake wounds and blood, and if we didn’t catch their injuries fast enough and provide proper treatment, they could go into shock or even die on us. I was a role player the first time around and got to pretend I was experiencing psychological shock, and it was eye opening to watch my fellow students try to organize the treatment area and deal with the chaos. Then it was my turn. As the lead of the treatment area, it was my job to try to keep track of what was happening at the disaster site and then direct both my team members and uninjured individuals as we dealth with those who were critically-wounded. I never thought it would be that hard to deal with a half-dozen people, but I never imagined the reality of doing so while people were running around, screaming, wandering off, and constantly yelling your name. 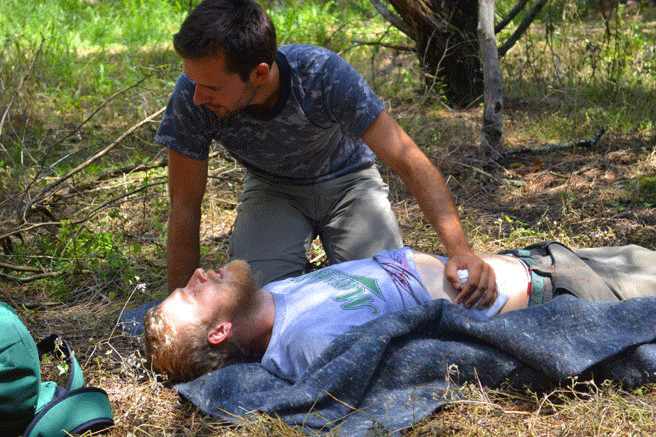 As someone who is learning first aid and herbal medicine, this was my first real experience dealing with patients, and even though it was all simulated, it was still incredibly intense. It’s a lot of work and impossible to explain to someone who’s never been there, but it was also an amazing experience that boosted my confidence a lot because of how much I learned from the experience. For more information or to find out how you can connect with your local CERT organizers, visit the national CERT website.